8x8 is a hosted VoIP service that offers competitive rates for a business-focused service that comes with instant messaging and web conferencing included. 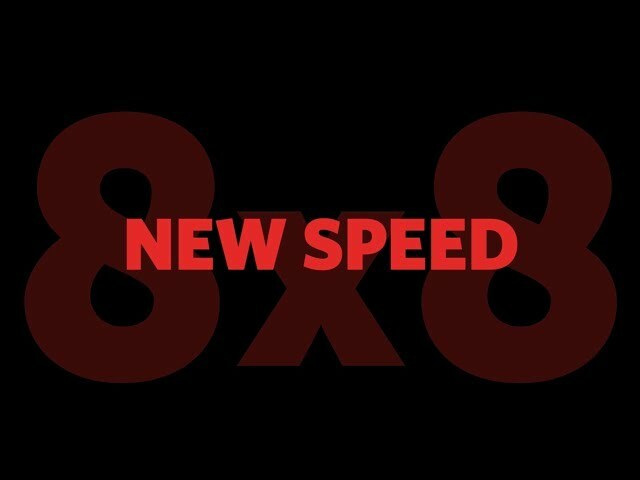 8x8 refers to its VoIP product as “so much more than a business phone system.” The system allows for web conferencing, seamless integration with 3rd-party business applications, is part of a global communications system with top-notch security and extensive analytics, and is accessible from your office phones, desktop PCs, and mobile devices. • A global network spread across 12 data centres, ensuring quick, clear connections no matter where you’re calling. • Enterprise-level analytics gives businesses a comprehensive overview of their phone usage (how many calls, how long, how many lost, how many unreturned, etc). Also tracks when call quality is at its worst. For an affordable VoIP service, 8x8 Virtual Office comes with an impressive list of features. The cloud-hosted PBX service comes with a standard auto attendant and allows you to easily move all your contacts over. The system can be used on both iPhone and Android, as well as desktop computers, and is easily managed through the online portal. Instant messaging is standard, and video conferencing is one of a number of features that makes it easier to hold “meetings” with large numbers of contacts regardless of where they’re located. Other options include extensive analytics to crunch the numbers for you, and the ability to connect your fax machine to the internet. The system is also easily integrated with a wide array of office products. 8x8 has some of the most extensive integration options of any brand on the market. Major CRM and business management players like Salesforce, Outlook, Smartoffice, and Netsuite are among over 30 different digital tools that can be integrated with your 8x8 account, helping improve your company’s productivity, workflow, and customer service. Outlook integration comes standard on 8x8 Virtual Office. 8x8 contacts integration allows users to upload and consolidate their contacts into their 8x8 virtual office desktop application directory. On the platform, they can be easily searched and sorted on desktop computers or mobile devices. Programs that can integrate their contacts with 8x8 include Gmail, Exchange, Office365, Outlook, and Skype for Business. There are 3 extensions that are available to purchase, including unlimited calls to several foreign countries and unlimited worldwide network calls with any 8x8 customer. With the Unlimited Extension Pro Plan, web conferencing, internet fax, and call recording are thrown in. The global extension allows for free unlimited calling to a host of foreign countries. Plans are billed on a monthly basis. 8x8 has mobile apps for both iPhone and Android which are downloadable from the Apple App Store and Google Play and allow you to operate the VoIP system from your mobile devices. The virtual office app allows you to access all of your personal and business contacts on your mobile device and use it to make secure business calls from any location. You can also use the app to make personal calls using your 8x8 plan, saving you money on your cellular phone plan. This applies to both long distance and international calls. When you’re traveling abroad, you can avoid roaming charges, due to the fact that you are using your 8x8 plan and not your cell provider’s data plan. The app also allows you to switch from your desk phone to cell phone during calls without interruption and set up your account to automatically forward calls from your desk phone to your mobile device. Scalability isn’t a problem with 8x8 as your monthly fee is per user. If more lines are needed, more users are added and your costs are adjusted accordingly. The cloud-based system is highly flexible and even large-scale businesses can add or remove extensions quickly and painlessly at any time. 8x8’s Communication Cloud is a system tailor-made for enterprise level businesses that need hundreds or more extensions. Activation is simple and takes a matter of minutes. First, take your activation code from the welcome email sent by 8x8. When you receive your package from 8x8 it will include the IP phone, a power cable, and an Ethernet cable. Turn over the phone and plug the Ethernet into the LAN port (and then into the internet jack) then connect the power cable to the phone and connect the phone handset. The phone will reboot and once it connects to the network an activate button will appear, press it and enter your activation code. The phone will then restart and you will be ready to make calls. Tutorials can be found on the 8x8 website and customer service representatives can help if needed. Before using your 8x8 Virtual Office phone, create a profile in the account manager. With the account manager you can create and edit user profiles, add users, configure and manage extensions, manage phone system features such as auto attendant and music on hold, transfer phone numbers to 8x8 service, update your payment methods, check your order status, track support cases, and more. 8x8 offers a variety of phones, including IP phones manufactured by Polycom, Cisco, and Yealink, cordless IP phones manufactured by Panasonic and Yealink, IP conference phones from Polycom and Yealink, and analog phones/fax adaptors from Cisco, Obihai, and AudioCodes.It can also provide an assortment of accessories, including headsets, QoS routers and WiFi adapters, webcams, and sidecars. If you’re feeling some sticker shock, you can bring your own CISCO phone over from a different provider, after provisioning it. This is a fairly simple process and instructions can be found on the 8x8 website. Wireless headsets can be purchased from 8x8 with prices ranging. Customer service can be reached by phone at 0333-043-8888. There is an extensive knowledge base on the support website with answers to a vast array of customer enquiries. Though the knowledge base is very helpful, the company’s customer service working hours leave something to be desired. Representatives are available by phone from 8am to 6:30pm Monday through Friday. As one of the most heavily-used VoIP services on the market, there are enough online forums where answers can be found to what ails you. Metred international calls can be made at a minute-by-minute rate by all Virtual Office customers. With the unlimited global extension plan, you get unlimited calling to 40 international locations, through mobile phones, and premium, special, and information service numbers are not included. 8x8 prides itself on placing all of its customers’ needs under one unified communication suite. The unified communications suite includes the VoIP service, virtual meetings, video conferences, mobile apps, and visual voicemail. In 2016, the technology and research firm Gartner Inc. named 8x8 as one of the top companies in the “Magic Quadrant for Unified Communications as a Service (UCaaS), Worldwide,” the 5th straight year that the company was placed in this rarified echelon. 8x8 is the world leader in cloud-based VoIP solutions for businesses and is used by well over 40,000 clients around the world. It has a massive global network of support staff and data centres and a proven track record of providing scalable, customizable communications solutions for businesses of all sizes, backed up by its communication cloud system to puts all their offerings under one roof. The system can fully integrate with dozens of office tools to help clients manage their businesses, and can easily be used with mobile devices. The company has secured over 130 patents and has repeatedly won awards for its products. 8x8 is a great option for VoIP customers from businesses of all sizes. It offers a host of features in its plans and all of it is adaptable to mobile devices, allowing users to manage their accounts no matter where they are and make calls from around the world while still on the 8x8 plan (thus saving money and data). The product is easily scalable even up to businesses that need thousands of extensions, and with data centres around the world, users can rest assured that call quality and speed will remain solid no matter where they’re calling. It also can integrate with dozens of office products (like Outlook and Salesforce), and is easily set up and managed both in house and remotely.